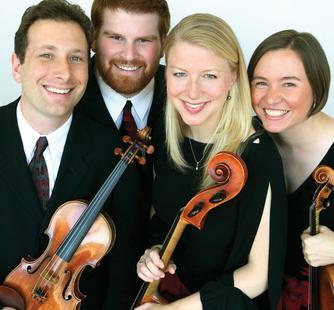 Cypress String Quartet celebrates the 11th year of their Call and Response program tonight at the Herbst theater. They’re one of a handful of San Francisco performing arts organizations that actually commissions new work. For this unique program they commission a composer to write a piece in response to their “call” (i.e. an existing piece in their repertoire.) This is particularly fitting for a quartet that spends equal amounts of time with new music and established classics, possessing an ear for both. This time around they break a bit from their established m.o. and add a level of indirection. They’ve commissioned a piece inspired by literature, similar to the way two pieces in their repertoire have been inspired by the written word. Elena Ruehr‘s Bel Canto is a response to Ann Patchett’s best selling novel of the same name, and will share the program with Schubert’s Death and the Maiden (inspired by the lyrics to a song that Schubert wrote himself) and (which apparently was inspired by the written word, but I haven’t yet figured out how). Tickets are available at the City Box Office and are cheaper if you buy them in advance. Alfred Hitchcock would be proud. So… why Music vs Theater? 4 Responses to So… why Music vs Theater? I got here from FB today! I’m really enjoying this. Reminds of the few and far between chats we have when we’re together. Now, I’ll be able to hear more from you on a regular basis! I had a little bit of a clue about what you meant by music vs. theater, based on what I’ve heard from you before. Thanks for swinging by Madley. Great to see others out there with similar interests..
A fairly common structural device in musicals is to sing a chorus or two of a song and then, without stopping for applause, have a short dialogue scene which wraps up the action of that scene and/or points ahead to what’s coming next. Meanwhile, the music of the song continues under the dialogue. That bit of dialogue business finished, we return to the song for one more chorus, or sometimes just a repeat of the last line or two. The reason for this: The end of a song gets applause, so it’s desirable to end the scene and the song at the same time so that the applause adds to the sense of conclusion of the scene and helps cover some of the transition to the next scene. Whereas the lamest way you can end a scene is to have the song end and then have maybe three or four lines of dialogue and then the scene ends. If your scene continues with more dialogue after the song, generally you need that dialogue to be substantial and significant, like a minute or more and containing some real plot, or it will come off as an anticlimax after the end of the song. So if the bit of dialogue you have isn’t important enough to stretch out to a minute or so, and you can’t cut it and you can’t place it before the song even starts, then what you can do is put it *within* the song. That’s not quite the same thing as what you’re talking about, as it’s not meant for comic effect — in fact, the writers are ardently hoping that it doesn’t call attention to itself as a device — but very similar in terms of structure. Another favorite interruption of mine from musical theater: In the act two opening number of The Most Happy Fella, the chorus number is abruptly interrupted in the middle of a phrase, the lights change, everybody on stage freezes except for two characters, and these two characters sing what they’re thinking about while everybody else is having a good time. Their music is completely different in mood, tempo, rhythm, everything — where the chorus is lively and joyful, their duet is brooding and anguished. Then they finish, the lighting changes back, and the chorus resumes its lively number in midphrase exactly where it left off. So what Loesser has there is a song actually being interrupted by a whole other song. And not for comedy, either — the effect is to make vivid these two people’s unhappiness in the middle of a crowd that’s celebrating. It’s a powerful moment. Here’s a favorite interruption of mine from opera: In the ORIGINAL version of Ariadne auf Naxos, in Zerbinetta’s big showpiece, at one point the orchestra crescendos to the point where it drowns her out, you can’t hear her singing her line. Zerbinetta gestures impatiently to the conductor in the pit to get him to quiet them down. The orchestra gets quieter, Zerbinetta gestures her approval, and she continues. Unfortunately when Strauss and von Hofmannsthal revised the opera, they shortened the showpiece and dropped this little moment of silliness. There’s a lovely joke of the same sort in Haydn’s 60th symphony: The last movement begins with a lively theme, but after a few measures there’s suddenly a terrible dissonance. The conductor stops the orchestra and has all the strings check their tuning. The pair of violins that is found to be incorrectly tuned then plays the offending note while tuning it, so you hear it slide up a half step. Then the movement starts over from the beginning and continues without further mishap. All this — the orchestra stopping, the tuning of the strings up a half step — is carefully written out in Haydn’s score. Dude, cuts like a knife. Is opera kid’s stuff? Or just silly? 5 Responses to Is opera kid’s stuff? Or just silly? Wow, my daughter (and son now) watch Wonder Pets at the grandparents. At first it really annoyed me, because of what you mentioned. But now I sort of appreciate the style it uses to communicate to the youngins. So much so, that we borrowed the CD from the library. It’s a frequent request now. I used to use “What’s Opera Doc” as a teaching tool for the college music appreciation classes I taught. It was the easiest way to explain the form of Grand Opera in 6 minutes (instead of 4 hours). It is an absolute piece of genious, that little 6 minute cartoon. I wonder about this idea of the need to repeat oneself textually to go with music. Because certainly there is plenty of musical theater (including modern opera) that does NOT do this. It was, of course, the style in previous eras (good lord how many Handel arias have I sung that are 7 minutes long and only have 3 LINES of text????) — but did the music demand it or was that a stylistic choice, a convention? The arias were used as a vehicle for showing off the voice as an instrument, more than for progressing the plot of the opera, it would seem. Were they really TRYING to be theatrical in those moments? I think you’re exactly right, and I’m starting to write out a post about how later styles of opera tried to get around this repetition thing. But the more I think about it, the repetition thing may not be endemic to the music. Did Mozart do a lot of it? It may just be that we’ve heard the “What’s Opera Doc” so often that the silly repetition has lodged into our collective minds as that “thing that opera does.” And since most Americans have never heard an opera in a language they understand, they have no idea whether or not opera actually does that. Eph, absolutely. Puccini has a much more modern approach to theater. Remember, Madama Butterfly is a 20th century opera (1904)! Wagner composed over half of the Ring cycle in the 1850s, before Tristan even.